We recommend that you read our prerequisites and guide available here before attempting an implementation. To begin connecting Brightpearl and ekmPowershop you will need to install the app. This will create a new sales channel in Brightpearl for reporting on sales from the ekmPowershop account. In Brightpearl, go to App Store. Find the ekmPowershop app and click Turn on. Channel Name: Enter a name for this channel. This is how you will identify the sales channel throughout Brightpearl; in menus, on reports, orders and accounting. Brand: Select a channel brand for this sales channel. Orders downloaded from this store will automatically take the company and logo set against this channel brand. Price list: Prices are not synchronized with ekmPowershop. This price list is used only as the default price list assigned to new customer records created through the integration. Every contact record requires a price list, which can also be considered a “customer group” in Brightpearl. Typically you’d use something like “Retail” - or you could create a dedicated price list. Note: Additional settings for bank accounts, order statuses and warehouses are defined within the ecommerce connector. 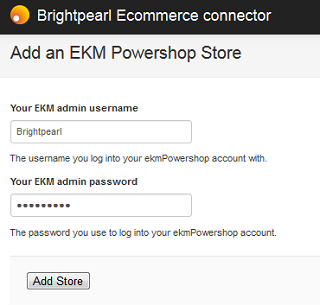 Before you get to connecting your Brightpearl account to your ekmPowershop account you will need to check that your ekmPowershop account is setup with stock control and product SKUs. As with other Brightpearl integrations, the product connection works by automatically matching SKUs across ekmPowershop and Brightpearl. As long as your products exist in both Brightpearl and Bigcommerce and have the same SKU Brightpearl will managed the inventory levels and allocate items to downloaded orders. It is therefore important that SKUs are added to ekmPowershop products and are unique for each product, and that those same SKUs are also applied to the products in Brightpearl. Log in to your ekmPowershop account and activate stock control a Settings > Stock Control. To assign SKUs to products in ekmPowershop you will need to install the "product attributes" feature. In ekmPowershop, go to Features and install Product Attributes. 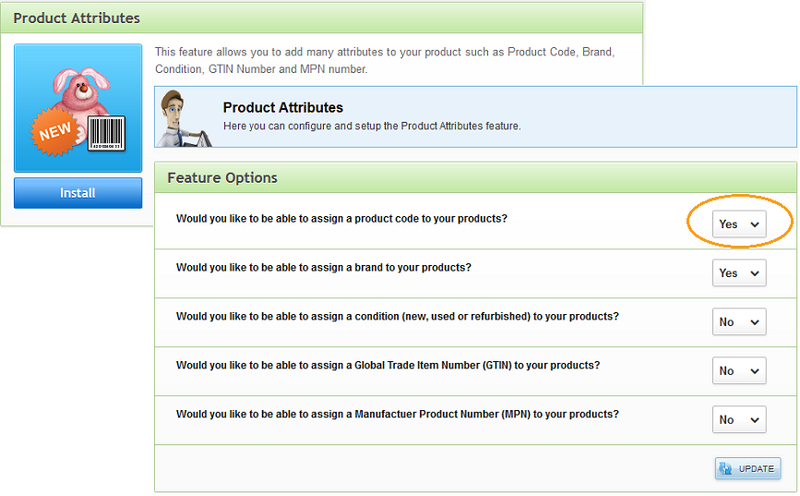 Once the product attribute feature is installed you will find the Product Code field available under Attributes on a product. Record your product SKUs in this field. Where a product has different variants, such as size or color, a unique Product Code (or SKU) is required for each variant choice. 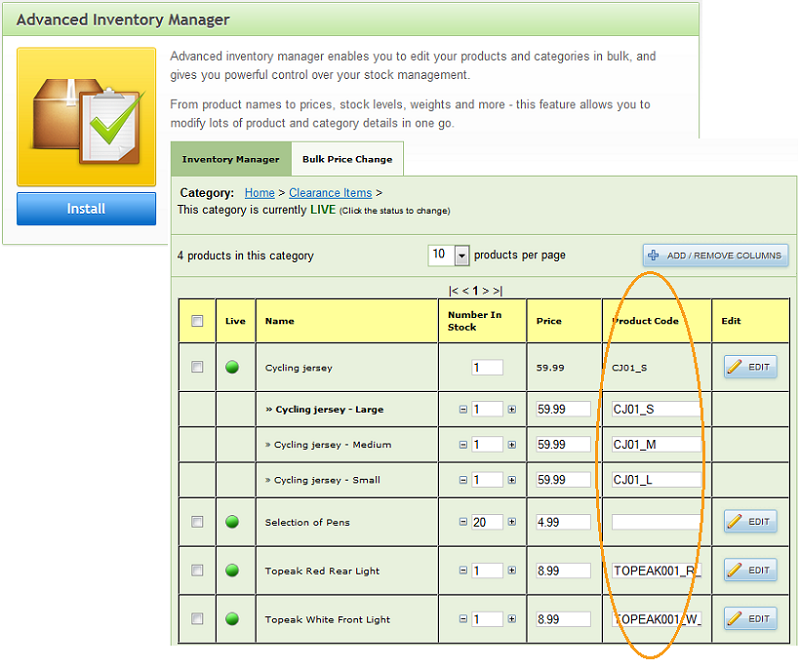 Install the Advanced Inventory Management feature to manage product codes (SKUs) in bulk. ekmPowershop provide export and import routines to help you update your product codes (SKUs) using spreadsheets. Read more about updating SKUs by CSV in the ekmPowershop documentation here . Once the app has been installed you can begin connecting ekmPowershop accounts. Each account to be connected will need its own sales channel in Brightpearl - installing the app creates one for you. If you have additional accounts to integrate you can manually create more sales channels for ekmPowershop. Brightpearl is linked to ekmPowershop via the ecommerce connector. To do this, log into the connector using your Brightpearl user login details. Access the connector from the setup button on the app in the App Store. Once logged into the connector click to add a new store. Each sales channel that exists in your Brightpearl account is listed. Select the ekmPowershop channel to be connected. You can add more later. Log in using your ekmPowershop username and password. At this stage the integration remains inactive. You will be able to import products before activating the inventory and order syncing. For each of your ekmPowershop accounts you will need to create a sales channel in Brightpearl and complete the connection within the connector. Two bank accounts can be assigned to each ekmPowershop channel - one for PayPal payments, and one for all other payment methods. The Brightpearl account (nominal) codes for these bank accounts must be typed into the ecommerce connector. When new orders download they will be automatically assigned the status chosen within the ecommerce connector. Remember you don't need to use a new status for every channel to see where it came from, instead you can add the channel column to your sales list within My Preferences (per user). Note that warehouses and price lists are controlled on the sales channel in Brightpearl. Log into the the connector from the setup button on the app in the App Store. Log in using your Brightpearl user details. Once logged into the connector select Actions > Settings for the relevant ekmPowershop store. Enter the account (nominal) code for the bank accounts to post payments into (find these in Brightpearl at Accounting > List bank accounts). Select the status new orders should be created on. Brightpearl is going to be your “master product list”, and your inventory levels will be managed from Brightpearl. All other product attributes, such as price, images, description and so on will be managed on your ekmPowershop store. Each product needs to exist in both ekmPowershop and Brightpearl with the same SKU so that they are able to be linked. Products which only exist in ekmPowershop will need to be exported and then imported to Brightpearl. Products which only exist in Brightpearl will need to be exported and then imported to ekmPowershop. Once installed use the extension to export products, for all categories. Select the fields to export and export the data to a XLS file. 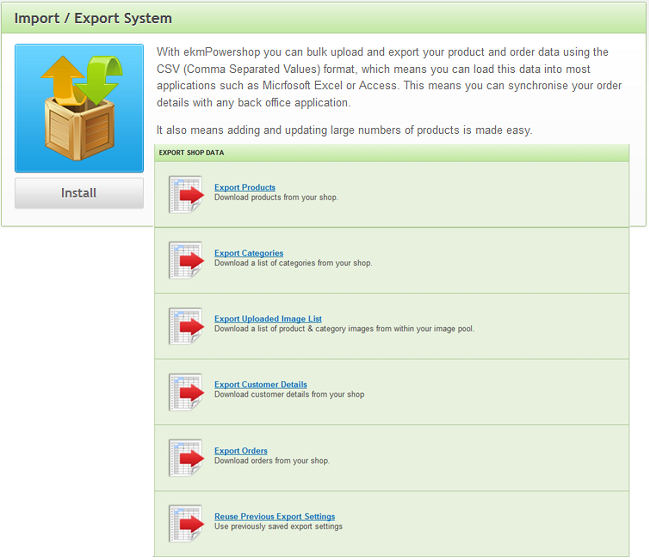 This is the type required when importing products in Brightpearl. Now that you have your ekmPowershop products in an XLS file you will need to format the file to meet the import criteria for Brightpearl. The ekmPowershop "Product Code" will be imported as the Brightpearl SKU, and is important for the integration to work. The product code is not a required field in ekmPowershop and is available only when the "Product Attributes" feature is installed. For the purposes of importing to Brightpearl this column should be renamed "SKU”. Ensure you have a column for "Brand"
All products in Brightpearl require a brand but this is not a required field in ekmPowershop, it is also only available to use when the "Products Attributes" feature is installed. There is no need to go back and update all your ekmPowershop products, simply add an additional column to your spreadsheet (if not already included) and assign the default Brightpearl brand "Other”. ekmPowershop and Brightpearl categories are not connected. When importing products to Brightpearl "category" is a required column - we recommend assigning all your ekmPowershop products to a category called "ekmPowershop" for the purpose of the import, and then managing your Brightpearl categories from within Brightpearl should you wish to. 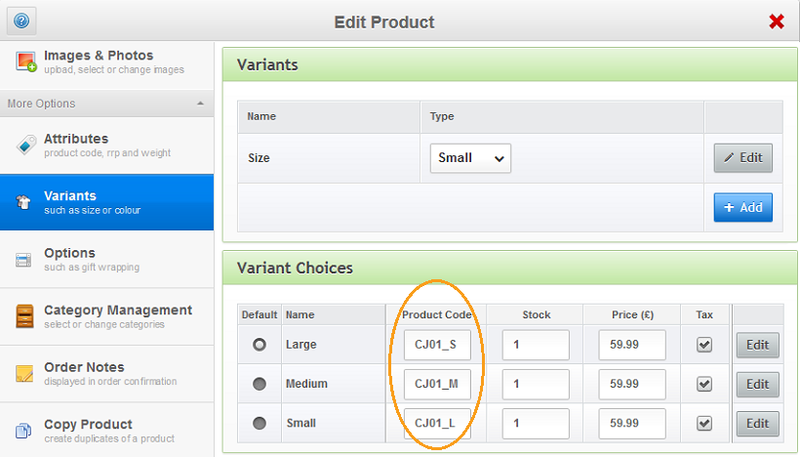 ekmPowershop variant names or options, such as "size" and "color" are listed in their own column, with the variant item or option value, such as "Small" or "Orange" listed in their own column. The variant names need to be made the column headers for the variant item and the column for the variant names removed (see image below). Any variant names or options (e.g. size or color) must already exist in Brightpearl prior to importing, however, the choices or option values (e.g. small or red) can be created as part of the import. The column headers in the file must match the name used in Brightpearl. ekmPowershop variant products are exported with a parent item. Brightpearl does not use parent products for variant management so they must all be removed prior to importing the file. When importing prices onto a product in Brightpearl the price list code must be included in the column header. The price list must already exist in Brightpearl. Cost prices are really important in Brightpearl since any updates to inventory levels creates accounting entries. The values posted rely on having cost prices. "CategoryPath" has been changed to "Category"
"Code" has been changed to "SKU"
The variant names have been assigned as column headers for the relevant variant item and the column then removed. Go to Settings > Data/Import > Import products. SKU: Every product in Brightpearl needs a unique SKU. Product SKUs should match across all your systems and sales channels. 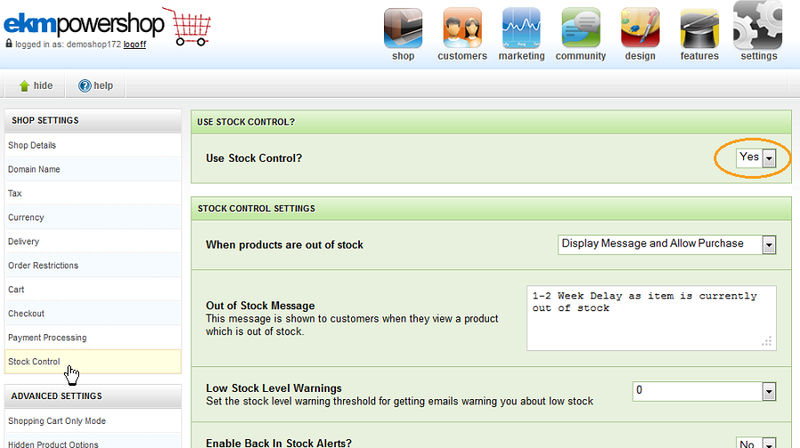 Manage stock: Set this to yes to make products stock tracked. Name: This is the item name. It should be the same when creating variants. Brand: Every product requires a brand. If this doesn't exist in Brightpearl already it can be created as part of the import. Category: Every product requires a category. If it doesn't exist in Brightpearl already it can be created as part of the import. Ensure the data map fields are in the same order as in the columns in the file. Once the data map is saved, click the Import link next to it. The data map is displayed on the left-hand side of the import screen. Ensure the import file has the same columns in the same order. The first column will be used to match the products. If& the data map needs editing, click the Edit this data map link in the top right-hand corner. Import values: Leave this unchecked to begin with and test everything is fine with the file. Email me a report: Check this box and a report of what happens with the import will be emailed to you. 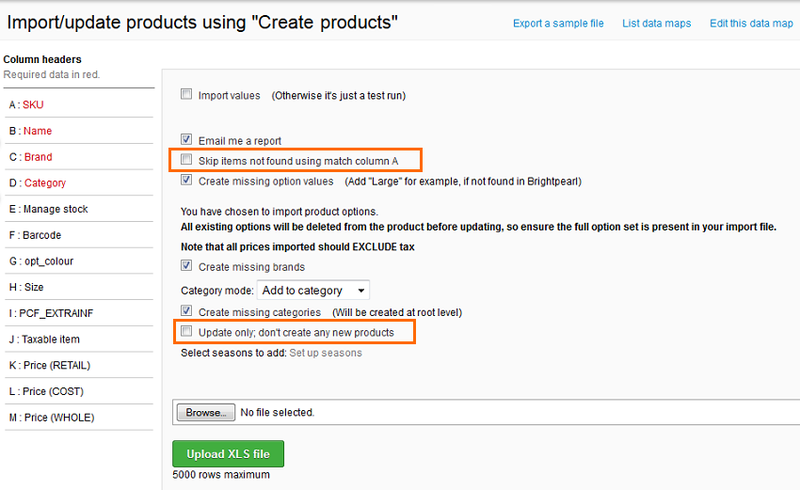 Skip items not found using match column A: When creating new products ensure this is unchecked. Create missing option values (displayed only when option fields are included): If the import file contains new option values for variants they will be created as part of the import. Create missing brands (displayed only when "brand" field is included): If the import file contains brand names which are new then this box can be checked to create them. If all brands should already exist in Brightpearl leave it unchecked. Beware that the import will fail if there are brands in the file which are not in Brightpearl. This may indicate misspelt brands in the file. Category mode (displayed only when "category" field is included): When importing new products they will always be added to the category, since there is nothing to move. Create missing categories (displayed only when "category" field is included): This can be checked to create new categories where they don't yet exist in Brightpearl. Alternatively, leave it unchecked to prevent new categories from being created. Beware that the import will fail if there are categories in the file which are not in Brightpearl. This may indicate misspelt categories in the file. Update only; don't create any new products: When creating new products unsure this is unchecked. Select seasons to add: If you are using seasons select to which season the products should be added. Hold down the control key and select multiple seasons if required. Click the Browse button and find the file to be imported. Click the Upload XLS file button to attempt the import. Messages will be displayed at the top of the screen to report what has happened. No data will be uploaded or downloaded until the integration is activated from with the ecommerce connector. Activating inventory sync will mean Brightpearl will keep your ekmPowershop stock levels the same as they are in Brightpearl. 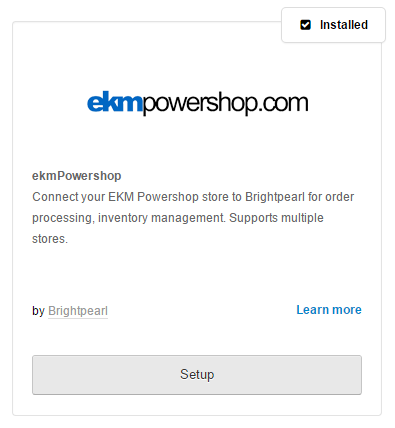 Activating order sync will mean any new orders received through your ekmPowershop store will automatically download into Brightpearl. This will also create new customer records. Activating sales receipt sync will mean that orders are automatically marked as paid and the necessary accounting is created in Brightpearl. Access the ecommerce connector via Brightpearl, go to App Store and click Setup for ekmPowershop. Log into the connector using your Brightpearl staff login. Once in the connector select Action > Settings for the relevant channel. Check the channel settings on the right-hand side are correct. New order status: This is the sales order status downloaded orders will be placed on. This is the default new quote status set in Brightpearl at Settings > Sales > Sales workflow. Warehouse for allocation: This is the warehouse selected for inventory syncing on the sales channel in Brightpearl. New orders will also be assigned to this warehouse and inventory will be allocated to the order from this warehouse. Select which options to activate. Note that once an order is marked as paid in Brightpearl accounting entries will be made and the payment will have to be reversed in order to cancel the order. If you plan on placing test orders you might want to activate sales receipt downloads later on. Brightpearl manages inventory for this store: Select to update ekmPowershop inventory levels each time the on-hand inventory level (of the same SKU) in Brightpearl changes. Inventory levels will not be updated until the next change is made. Download orders into Brightpearl: Select to automatically download new orders received through your ekmPowershop store into Brightpearl. Create sales receipts in Brightpearl: Select to automatically mark downloaded orders as paid. This will create sales receipts and accounting for each order whether a payment has been received or not. Bank account for sales receipt & PayPal sales receipts: Enter the nominal code for the bank accounts into which you want payments to be posted in Brightpearl, and another on for PayPal payments - this can be the same. Find this code in Brightpearl at Accounting > List bank accounts. On hand inventory levels are sent to ekmPowershop from the warehouse selected against the ekmPowershop sales channel in within Brightpearl. 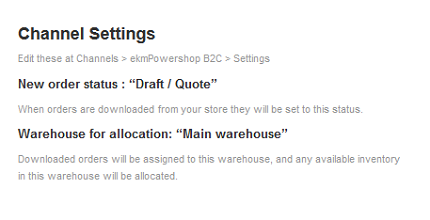 Only inventory levels for matching SKUs will be uploaded to ekmPowershop. Inventory levels won't automatically become in sync across all your products since Brightpearl will only send inventory updates when the quantities change, for example, when items are received into stock, items are allocated to a sale or stock corrections are made. This is a good time to run a stock take and update Brightpearl inventory levels, which will automatically push inventory levels to ekmPowershop (for any that change). However, over time Brightpearl and ekmPowershop will gradually come in line. Alternatively, we can run a full inventory level sync for you. Please speak to your implementation consultant or contact our Support team. It is important that you assign cost prices to products when updating inventory levels as these are used to calculate the value of your inventory and create accounting journals. When these items are sold the value is used to record cost of sales and your overall profit on the sale of the item (except where cost of sales accounting = "No"). Cost prices are also needed when purchasing and receiving inventory from your suppliers. These values are, again, used for updating stock assets in accounting. Your Brightpearl implementation consultant can do this for you, otherwise, please contact our Support team who will be able to assist. Once in the connector select Action > Update Inventory Levels for the relevant channel. 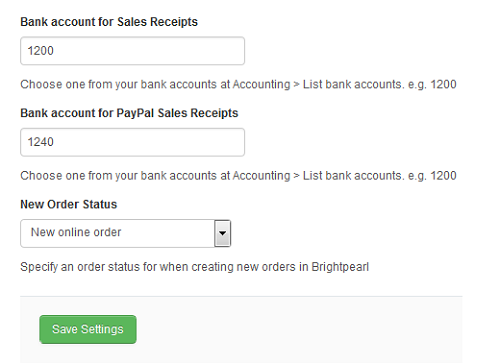 Each ekmPowershop account is added as a separate sales channel in Brightpearl allowing you to separate sales reporting. When the ekmPowershop app is installed it creates a sales channel which is used for connecting to your ekmPowershop account. 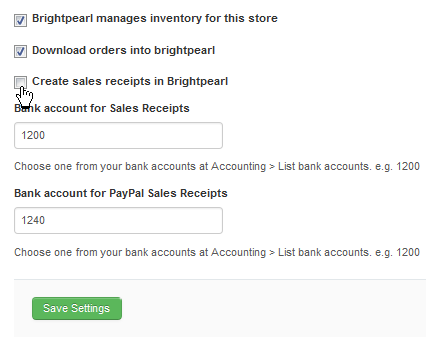 To integrate additional accounts you will need to create more ekmPowershop sales channels in Brightpearl. You will then be able to repeat the same set up implementation steps. Go to Channels > Manage Channels. Select the type of channel you wish to create. Enter a name for the channel - this is how it will be displayed throughout Brightpearl and how you will recognize where sales have been made. Depending on the channel type, make the other necessary entries. Read the relevant channel implementation guide for field descriptions.